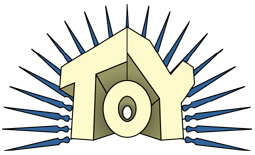 The ToY Awards started back in 1998, when I was just doing reviews on my own. Yes, there were other end-of-year awards around at the time, but most of them focussed primarily on "child safe" toys, handing out praise for educational content, safety in manufacturing, and encouraging non-violent play patterns. I wanted to honor the toys that older toy fans actually liked. ToyFare magazine had a similar year-ender, but when I started, they were nothing but whores to Star Wars. Then they went out of their way to ignore McFarlane. Plus, they had a tendency to include toys to which they as a news outlet had access, but normal collectors did not; things that they had received as samples, but weren't due on the shelf for a few months. Though initially very hard to find, eventually distribution caught up with him. The toy looks great in both modes, and his transformation is elegent - neither too complex nor too easy. He's fun to play with, he's very poseable and the sculpt is cool. Warpath is a figure worth buying the first time you see him. Other nominees included Orange Lantern Lex Luthor, for his cool sculpt, useful articulation and translucent orange plastic • GI Joe Low-Light has great sculpt, great accessories, and even the filecard is an improvement • Marvel Select Juggernaut for finally living up to the size the character deserves • Lion-O may be 8" tall, but he's a nearly perfect version of the character • Duke Nukem was everything we'd hope he would have been • GI Joe Skystriker is reasonably priced and corrects issues the original toy had • POC Snake-Eyes is as close to an "ultimate" version of the character as we've had, and the only reason he didn't win is because he was so hard to find (and coming with a wolf would have been nice, too). Yes, the only way to get these toys was to buy them online, but those exact words could be said about almost any of the nominees this year. The line is small - only 10 (or 12) figures - and they all share the same mold, but it's one hell of a great mold! The paint makes a huge difference in all the figures, and the backstory gives us a reason why all the figures share the same body: they're all the same guy at different points in time. The accessories are nice, the packaging is stylish, and the plentiful articulation all works without sticking or breaking. Compared to mass-market figures at the same pricepoint, Scarabus and his crew are jaw droppingly detailed. We waited three years to get these figures, and the wait was worth it. Queen Marlena (in her two guises) was a nice figure, but she would have been easy to pass up if not for the inclusion of Cringer. He's scaled to work with the "MO2K" figures just as well as with the "Classics," and that pushed the set into "buy" territory. Though it's done as a hated clamshell, the idea of turning Batman's distinctive cowl into the blister that holds the figure is very clever, and it's surprising it's never been done before. McFarlane Toys was built on one simple idea: do things everyone said couldn't be done, and do it better than anyone else could. The company was known for its incredible sculptors and its incredible sculpts, and was the first American company to prove that a licensed toy could look like the person it was meant to represent. All that went out the window with The Walking Dead line, which is sculpted so poorly that when the first figures were shown off, no one could tell whether they were supposed to be from the comic or tv-based line, because the designs were so far off-model. The figures are done in a 5" scale, making them incompatible with almost every toy made after 1998, they have the most illogical articulation imaginable and, perhaps worst of all, they cost 50% more than reason dictates they should. Badly designed, badly made and badly sold - this is a shocking new low for a once-respected company. The "clear plastic"/"alternate color" variant is a common source for exclusives, but rarely is it an actual character from the property. Mucus Tick showed up in a single episode of The Tick cartoon, where he was physically identical to Tick, but was translucent green. He wasn't a real villain, though - more of a mindless henchman, so he's not absolutely necessary for a Tick collection. He even gets unique packaging to set him apart from the crowd! Now that you know what's won this year, you can head on over to see our past winners. The Class of 2011 joined some illustrious ranks, and they're all archived here.